Think Before You Link to Your Squeeze Page With These Tips! I want to capture highly qualified leads to build my brand recognition and stay on my reader’s minds, so I decide to create a squeeze page that shows what I have to offer and it prompts visitors to subscribe. It only seems like an ideal fit to add the link to my squeeze page in the Resource Box of my articles because I’ve built my reader’s trust in my credibility and surely, they’re ready to subscribe. What could go wrong? It’s easy to assume that new readers are clamoring to subscribe once they’ve read your article, but the high bounce rates of most squeeze pages suggest otherwise. Squeeze pages are landing pages that are specifically created to capture leads or ask visitors to subscribe to whatever you’re offering, such as newsletters, ebooks, webinars, etc. Unlike offering a simple opt-in box integrated into your content-rich website, squeeze pages typically don’t offer the reader any other choice – it’s either opt-in or get out. As online information becomes less secure, readers are increasingly reluctant to opt-in. Discover how you can build a list of highly qualified leads and use your articles to give your efforts a boost using this flow chart with an extended transcription as your guide! Simply click on the graphic below to view in a new window and then click the image to zoom in or out. Should I link to my squeeze page? There are a number of factors that you should consider before you add a link to your squeeze page in your article submissions. First, determine whether you will also include a link to your blog or website in addition to your squeeze page. Relevant? If after reading an article about Heart Health, then the user expects to visit a website that is an extension of Heart Health. If the user is led to a website on relationship break ups or box car racing, then the user is going to click away feeling scammed. Your blog or website must be an extension of the topic of the article to ensure a good user experience. Easy to navigate? Intuitive navigation and ease of use is paramount to your website’s success. Avoid using pop ups, circular linking, and other methods that either distract or delay the user from achieving the benefit they will gain from your website. Transparent? Clearly displaying who you are, your intentions, and the benefit you provide visitors is paramount to your success. Illustrate the who, what, where, when, and why of your business or service to build trust. Compelling? Whether in the form of a blog, downloadable PDFs, informative videos, and more, provide fresh and compelling content on a regular basis. Encourage visitors to return by becoming their number one, quality resource that meets their needs. Balanced? Pages cluttered in ads and outbound links are confusing to readers. Ensure your ad-to-content ratio as well as any outbound links are balanced with your content to highlight your message as the main benefit to the reader. 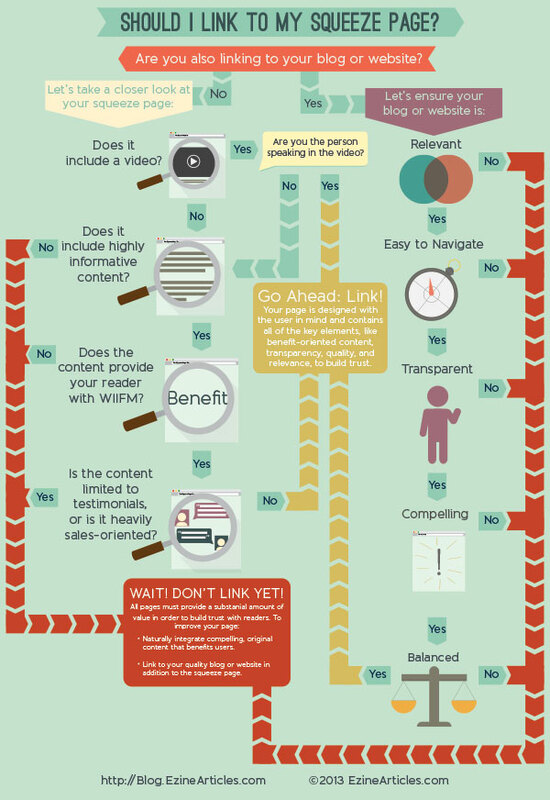 Does your blog or website meet the above criteria? If yes, go ahead and link to your blog or website and your squeeze page in the Resource Box of your article submission! Your page is designed with the user in mind and contains all of the key elements to build trust! If you’re missing any of the above criteria, we suggest creating an action plan to meet each element until you’re confident that your website provides a positive user experience. If you’re not linking to your quality blog or website, then let’s take a closer look at your squeeze page. Does your squeeze page include a video? Go ahead: link your squeeze page to your article. Featuring yourself in a video creates a connection trust for your readers. A video is small investment in time and production that can work wonders. Not only does it build your transparency, it also shows your readers you’re invested in your credibility and building their trust. Visitors are hesitant to buy in to a message that’s not originally the author’s vision with whom they originally built a connection. They see an author invested in another person’s vision, product, or service, which begs all sorts of questions (“Does this author really know what they’re talking about?” and “Is this a scheme?”). Rather than using a stock promotional video, show your investment and build trust by including a video on your squeeze page featuring you to assert your credibility and authority. Does your squeeze page include highly detailed and informative content? Does this content provide your reader with a WIIFM benefit? Is the content more than just testimonials? Is the content more than blatant sales-oriented language? If you’ve answered “yes” to the above questions, then go ahead: link to your squeeze page in the Resource Box of your article submission! Your squeeze page is designed with the user in mind and contains all of the key elements to build trust! Nationally integrating compelling, original content that benefits users. Including a link to your high-quality blog or website in addition to the squeeze page in the Resource Box of your article submission. Questions? Comments? Share your feedback below – we’d love to hear from you! Great post as always, but I’d add one more qualifier: Is the offer/information on your squeeze page time sensitive? Many squeeze pages feature information or products that is/are only valid for a limited time, but a good article drives traffic for years. Avoid linking to squeeze pages about systems, software or technologies that will no longer be valid 6 months or a year from now. Good post, but it seems like ALOT of things to think about before linking to a squeeze page lol. I generally test my squeeze page with PPC before i do any kind of credibility marketing or free marketing for my site. I guess you can say i “trial and error” it lol. Search engines measure a website’s value and relevance by analyzing the links to the site from other websites. The resulting “link popularity” is a measure of the number and quality of links to your website. It is an integral part of a website’s ranking in search engines. Search engines examine each of the links to your website to determine its value. Although every link to a website is a vote in its favor, not all votes are counted equally. A website with similar subject matter to the website receiving the inbound link carries more weight than an unrelated site, and a well-regarded site (such as a University) has higher link quality than an unknown or disreputable website…. this is a good one Chris. I’d rather have a link to my website, and include an invitation to join/subscribe on every page of the site. This way, the invite is always there as visitors build trust while browsing your site. This makes them feel like it was their choice to subscribe, not squeezed (pressured) in. Valuable information. Big reminder to do the work to provide value for our readers. I guess that to give value and good content is the new keyword for Internet. I am tired of searching for one thing and getting totally different content. Quite informative and serves the purpose of lesson, reminder and a check list for every newbie in internet marketing. I’m really glad to read this post and learned how to decrease the page bounce rate. I think original content with keywords base tagline, video tutorial, attractive infographic visualization, e-book etc can help to solve this problem. I like the flow chart together with the narration. well, perhaps a video to follow along?